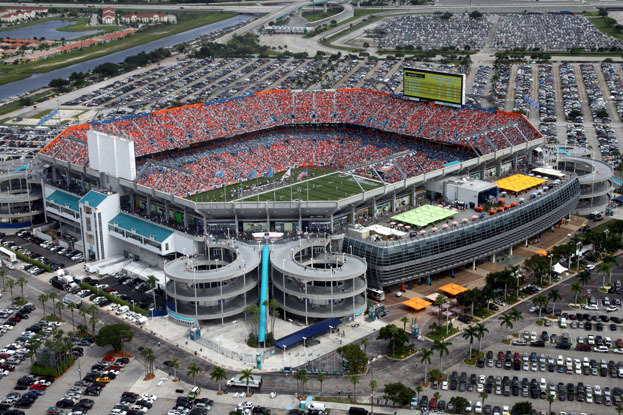 It's easy to forget that in 1987 when Joe Robbie Stadium became the home of legendary quarterback Dan Marino's NFL Miami Dolphins, it also presented a new business model for American professional sports. Instead of relying on public bond issues to get the stadium erected, the project was privately financed, in part by the sale of club-level seating and executive suites. At the time, the concept of live sporting events with amenities like sushi bars and air-conditioning, leather wingback chairs and flat-screen TVs was still far-fetched. But in the 20-plus years since, it's become standard procedure for team owners and their architects to focus on creating what is now known as the spectator experience. 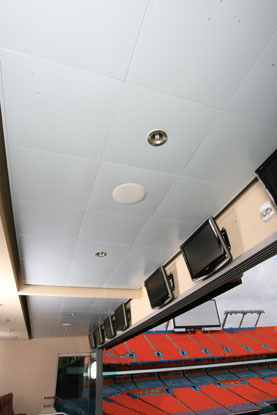 The new Dolphin Stadium renovations, led by Kansas City - based HOK Sport, boast those features and more, including highly designed suites that coordinate with the team's colors, from the orange walls to the complementary blue Hunter Douglas ceilings. No design firm has perfected and programmed that philosophy more successfully than HOK, the architect of hundreds of ballparks and arenas around the world, including the pioneering design for the original construction of the team's stadium in 1987. So it was no surprise that HOK also led the $300 million renovations. Upgrades include floorspace that is twice as large, giving game-goers a little more room to spread out, and the installation of hundreds of high-definition plasma-screen TVs, which make it nearly impossible to miss a play during a hotdog run. And for replays on the field, every fan will be amazed by what is one of the largest (135 feet long x 50 feet high) digital scoreboard displays in the sporting world. 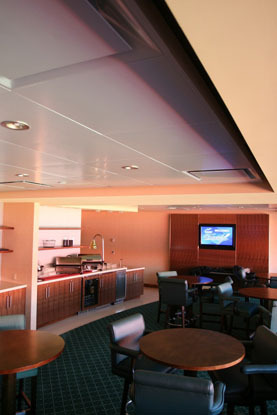 But true to the stadium's beginnings, this pricy upgrade was also privately funded (by stadium owner H. Wayne Huizenga) and capitalizes on converting the upscale aesthetics and amenities of the Club Level and luxury suites into premium ticket sales. 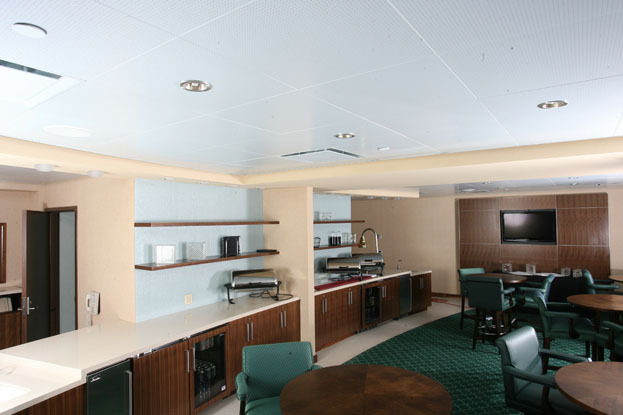 The Dolphin suites boast all the trimmings of first-class comfort, including personal attendants, private bathrooms, kitchenettes and serving stations for game-time snacks, cushy stadium-style seats, and flat-panel displays for the armchair quarterback. 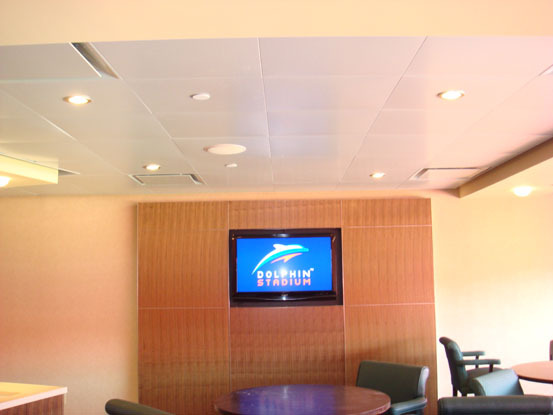 Of course, the interiors are trimmed to coordinate with a sophisticated Dolphin color palette: swivel chairs in teal, walls in light teal and orange with complementary accents, and ceilings custom-painted in a matching blue. 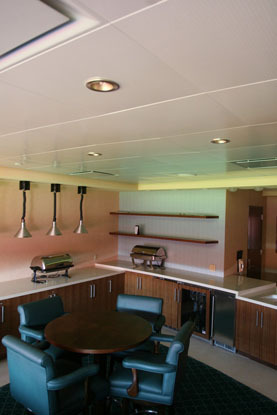 These Hunter Douglas Torsion-Spring ceilings were specified for their ease of maintenance, as the side-spring design allows panels to swing downward for plenum access. 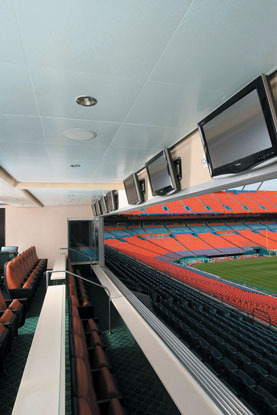 Quite possibly the most unexpected and exciting and potentially iconic feature of the new Dolphin Stadium is the 40-foot-high glass curtain wall that encloses the Club Level and affords expansive views of the South Florida skyline. The wall's convex, bulging shape was meant to recall the hull of Florida-frequenting cruise ships, say the architects. Meanwhile, the stunning vistas and airy space bring the best of Florida's leisurely indoor-outdoor living to the site. According to Joe Bailey, the chief executive of Dolphins Enterprises, "We are positioning the stadium at the crossroads of Disney with magic, Ritz-Carlton with service, Google with technology and innovation and Broadway with live performance. If you take those four components," he told the Miami Herald, "this is really what we want the stadium to become - a showplace for the Americas."